Whose Shall The Welcome Be? 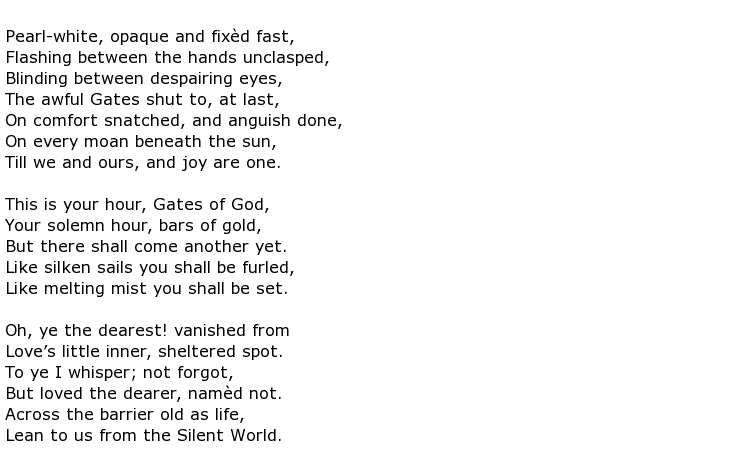 Elizabeth Stuart Phelps Ward was an American poet and spiritualist novelist of the second half of the 19th century who was, undoubtedly, a controversial figure. Indeed, she was very much ahead of her time, an example coming during the 1880s when she was a keen advocate of reform for women’s clothing. She openly encouraged her sisters to throw off the shackles of their corsets, clearly suggesting that they should no longer be forced to wear such restrictive and uncomfortable garments. 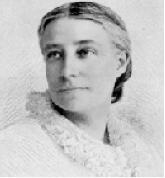 She was born Mary Gray Phelps on the 31st August 1844 in Andover, Massachusetts, the daughter of a well-respected Congregational minister and writer of many religious texts that are still in use in educational establishments to this day. Her mother died when Mary was eight years old and, as a way of honouring her mother, she decided to adopt her names, from then on being known as Elizabeth Stuart Phelps. She was encouraged to write from an early age by both parents, both of whom were published authors in their own right. Mary was well educated, firstly attending the prestigious Abbot Academy preparatory school in Andover. She finished off her education at Mrs Edwards’ School for Young Ladies. Her abilities as both a writer and an orator of tall tales were evident from a very young age and her first short story was published at the age of 13 in a publication called Youth’s Companion. She followed this up with other stories which were seen in Sunday School publications. It was perhaps a protest against a religious upbringing that prompted her, during her 20s, to challenge the traditional ideas surrounding the afterlife. She wrote the first of a trilogy of spiritualist novels in 1868 called The Gates Ajar in which people would be reunited with departed family members, and even family pets, and would then be able to take up a new “life” of domestic bliss until the end of eternity. She was a prolific author with at least 57 books being published under her name, these being a mixture of poetry, fiction and collected essays. She was a vigorous campaigner and supporter of the idea that women should not be restricted to a home life of wife and mother. It was perfectly acceptable for women to lecture at universities (she did so at Boston) and that their career paths into such fields as medicine, the arts and even the church should not be blocked by unenlightened men. Her 1877 novel The Story of Avis explored what would now be called feminist issues but, at that time, were something new and quite shocking to some. None of this prevented her from getting married though. It should, however, be noted that she caused some scandal by marrying fellow writer Herbert Dickinson Ward in 1888 who was a man seventeen years her junior. Another facet of early 20th century life prompted her into writing a novel called Trixy which was published in 1904. The controversial theme of this book was vivisection. She passionately believed that it was NOT necessary to experiment on animals in order to further any advances in medicine. Elizabeth Stuart Phelps Ward died on the 28th January 1911 at the age of 66.